IGTV is a platform launched by Instagram which allows users to upload & watch long-form, vertical videos. You can use this platform either through Instagram app, or install a standalone app on the market. Like YouTube, IGTV now owns many interesting videos, and it’s a good idea to download these videos offline, either for keepsakes or for sharing them with your friends who aren’t on IGTV. So here we are going to share 3 practical IGTV video downloader, now let’s check the list and grab the best one. It’s hard to imagine a world without Instagram. Initially, it was a purely photo-sharing app, in order to compete with then-popular short video-sharing site – vine, it incorporated a 15-second video feature. Before long, it added the support for widescreen videos. And in 2016, it increased the 15-second video limit to 60 seconds. Albums were introduced in February 2017, which allows up to 10 minutes of video to be shared in one post. And in June 2018, we have IGTV, and that’s what we want to talk about here. The first IGTV video downloader I’d like to introduce is Gihosoft TubeGet, it’s a video downloader software specializes in saving videos from YouTube, Tumblr, Twitter, Instagram, and IGTV is also included. Gihosoft TubeGet is popular among many users for its self-explanatory operation and powerful functions, such as downloading videos in batch, and extracting the subtitles & audios as well. Gihosoft TubeGet allows users only 3 simple steps to save IGTV footage on PC & Mac. Step 1. Copy the video URL on IGTV and paste it into Gihosoft TubeGet. Step 2. Choose the video resolution that you want to save, the higher resolution is, the bigger the size is, so does the clarity. Step 3. Download the video on your computer and play it any where any time as you wish without any hassle. Unlike Instagram, the IGTV enables users to upload longer videos up to 10 minutes, while verified and popular users can upload videos of up to 60 minutes. In the future, Instagram is planning to let all users upload videos of unlimited length. Another change is that the IGTV app automatically begins playing videos as soon as it is launched, which draws users into the video as fast as possible. As a competitor to YouTube, IGTV will try to attract video influencers to create more appealing videos to draw and keep more users. Then how to download these videos offline? ThumbTube is an online site that can do this work. 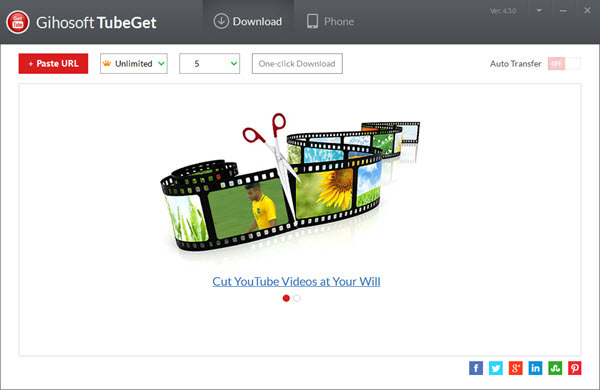 The advantage of online IGTV video downloader is that it’s compatible with all kind of platforms & devices, such as Windows, Mac, Android, iOS, Linux; computer, smartphones, tablet & PSP etc..
Now I will walk you through how to download IGTV videos online with ThumbTube. Step 1. Go to IGTV and find a video which you’d like to save on your mobile phone or computer, then copy the video link. Step 2. Paste the link of the IGTV video from app, open ThumbTube and paste the link in the textbox, click Download Video button on the right, then you come to the download page. Step 3. In the download page, there are 2 ways for you to save IGTV videos on your device. You can either click the 3 dots in the video controls and select Download; or you can directly right click on the Download Video button right below the video, and select Save Video As, then the video will be kept on your device immediately. IGTV is a vertical video application, so it’s only suitable for mobile, and you can hardly do anything with it on desktop. For video creators, IGTV won’t replace YouTube, for the latter too complete & successful not to focus on. But it can be a good complement for YouTube, as IGTV can provide something personal and on-the-fly, while YouTube is the paradise of polished contents. As IGTV is a mobile app, so it will be better to download IGTV videos on smartphones than on computer, then how to save keep IGTV videos offline on mobile phones? 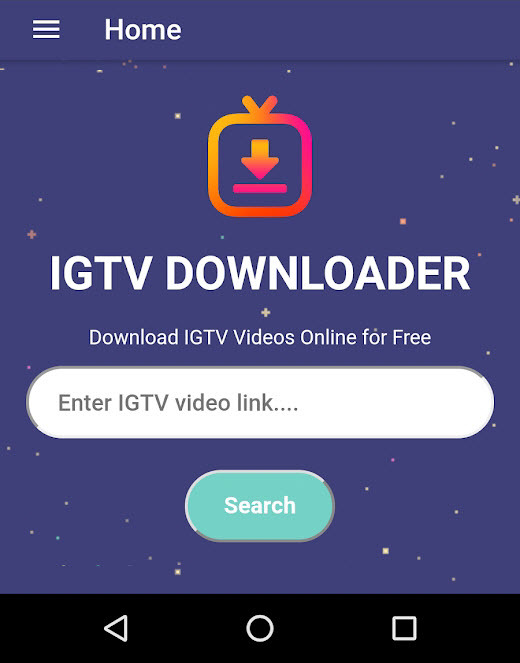 Well, here I will show you the best way to download videos from Instagram TV on your Android devices – an Android app called IGTV Video Downloader, you can download it from Google Play. IGTV Video Downloader is an excellent Android app which makes downloading IGTV videos easier than ever. With a simple design, decent look, it captures the hearts of many people. Now let’s come to the usage of this app. Download IGTV Video Downloader from Google Play and install it on your Android smartphone. Open this app and grant permissions it asks for. Search for the video you want to save, then open it. Then you will see 4 option icons on the video, just tap on the 3 dots icon, then select “Copy Link”from the popup. Open IGTV Video Downloader app, paste the link into the box, then click the Search button. Click Download button to start the downloading process. The downloading process can be seen in the notification bar, and the downloaded videos will be stored in “Downloads”folder. These are 3 tools that I recommend to download IGTV videos on your PC, Mac, Android & iPhone. You can check their user reviews before downloading that will help to take the right decision. So hopefully you will find your desired one on this list. And if you are using a different, then you can let us know in the comment section, we will include it in next update.